Not only is this an easy no bake cheesecake recipe, it's the best. Try it yourself - it's heaven on a fork. 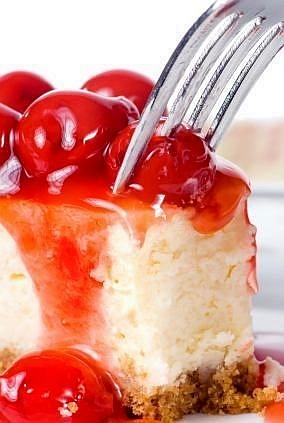 I absolutely love this homemade dessert, actually I prefer this over a baked cheesecake. You will know what I am talking about once you taste this. You may use any pie filling for this recipe. If you don't want the canned filling - just slice strawberries and cover with sugar. Let sit for a few hours to macerate (produce juice). Instead of a pie plate, just use cupcake liners. Mix together crushed pretzels, butter, and sugar in a bowl until well incorporated and crumbly. Press into a 9x13 inch pan and bake for 10 minutes; cool completely. Beat together the cream cheese, powdered sugar and vanilla; set aside. Beat the heavy whipping cream and 2 tablespoons of powdered sugar until peaks form. Add this to the cream cheese mixture and mix well. Spoon cream cheese filling into prepared crust. Smooth the top with a spatula, and refrigerate until firm, about 2 to 3 hours. Spread the cherry (strawberry, blueberry, etc) filling over the top, and refrigerate until serving. Easy to make isn't it? 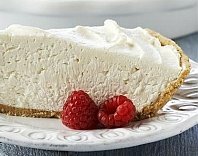 Hands down, I prefer this easy no bake cheesecake recipe to the baked cheesecake version - any day. This easy no bake cheesecake recipe is the base for whatever topping you want and is a pure vanilla enthusiast dream. Bake for 8 minutes or until it just starts to brown on the edges. Do not over bake. A light-colored or glass pan will absorb less heat than a dark one and help ensure against over baking. Cool. Beat together the cream cheese, powdered sugar, heavy whipping cream and vanilla in a bowl until smooth and spreadable. Taste the filling - you may add another tablespoon of vanilla if you wish. Pour cream cheese mixture into prepared crust. Smooth the top with a spatula, and refrigerate until firm, about 2 to 3 hours. Top with fresh berries or any of your favorite toppings like fresh raspberry sauce, caramel sauce or homemade butterscotch sauce.